Liz, Ashley and I stayed at the Best Western Raffles Inn and Suites when we went to BlizzCon. It's one of the official hotels of the convention and we got an amazing deal. 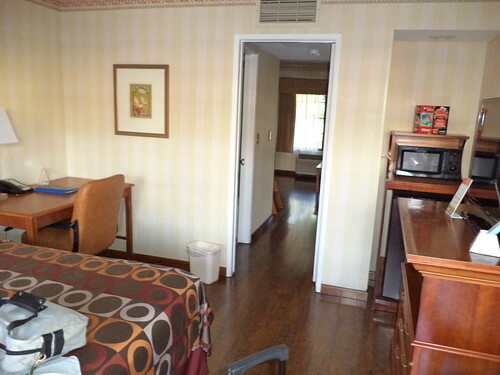 We had a two room suite, called the "Family Room". I got there first and claimed the front room. I would have traded with either of them, if they had wanted the queen-size bed. Liz and Ashley stayed in the back room. 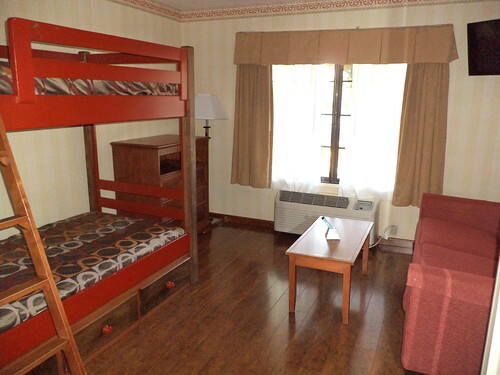 The couch folds out and that is a bunk bed. You could put 6 people in the room. 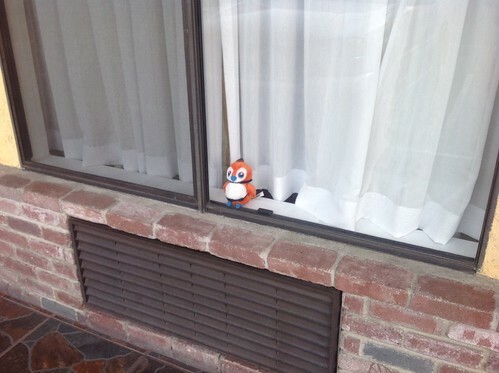 We marked our room with Pepe, a plush orange bird that is featured prominently within the game. That's my Pepe in the window. Liz put hers there, eventually, too. It was funny to look at the windows in the hotel and see all this Blizzard merchandise displayed. "Oh there's Pepe. Oh there's a zergling," you'd hear people say as if it was the most normal thing in the world to see a stuffed animal in your window. Once Liz arrived on Wednesday, at around 10:30 p.m. because her flight was delayed, we decided it was just better to head to bed. I went to the "bathroom", which was a space between the two rooms. In the top photo, you can see a door to the left. That's where the toilet and tub/shower were. To the right is where the sink and counter were. Privacy? HA! So, I'm brushing my teeth and I look to the right on the counter and, crap. 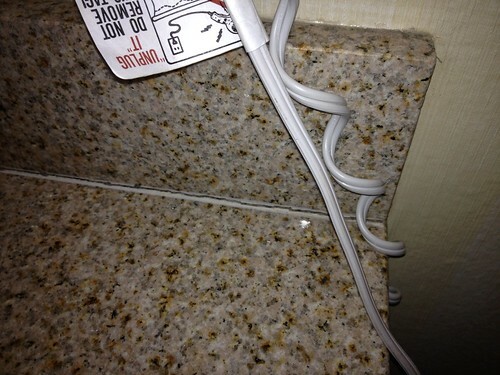 There's a junction crack between the counter and the splashboard. No one else would notice this. I sat down on the bed and told myself I was on vacation. Spotting defects in floors, walls and ceilings is part of my job, a job I was trying to leave behind for a few days. I've been doing this for nearly 16 years. It's hard to turn the job off. I sent this photo to my work colleagues who commiserated with me. "It can be so hard to turn it off," one of them said. "But try to have a good vacation." I allowed myself, twice a day, to notice the crack between the counter and the splashboard and then told myself that was the only defect I would notice on that day. It seemed to work or I was too busy having fun to notice if there was a crack at the upper left of door 3. Probably a combination of both.